Colloquial areas of Dublin | Come Here To Me! Dublin enjoys dozens of colloquial terms for neighborhoods and areas in the city, many of whom have now been assimilated into everyday language. I’ve tried to compile a list of ones that I can think of. Others may be more ‘true’ than others. Have I forgotten any? Perrystown, “a small south Dublin suburb located between Terenure, Greenhills, Templeogue and Crumlin” which was probably named after a former family of landowners in the area, the Perrys. While technically not an “unofficial area”. It would probably be better described as a small suburb within a larger one? Wikipedia says it is known as “The Secret Suburb” by its residents. Cowtown, an area in Dublin 7 beside Stoneybatter where there was once sprawling cattle markets. Street names like Oxo, Nialler, Murtagh, Beneeder, the Norrier leave a reminder of the area’s past. Informal group of Bohs supporters who live or grew up in the area. Maryland, a name for a small area just off Cork St.
Broadstone, an area of the North inner city bounded roughly by Phibsborough Road and Constitution Hill to the West, North Circular Road to the north, and Dorset Street and Bolton Street to the south-east. Harmonstown, is a small suburban locality straddling the boundary between modern-day Artane and Raheny. The locality is bounded by the railway cutting, the Springdale Road Linear Park and Brookwood Avenue. It also borders Killester and Clontarf. Summerhill, an area of the North Inner City. Anyone suggest what area actually constitutes Summerhill i.e. what boundries etc.? Hell, a popular term in the 17th century for the area around Christ Church Yard. The Monto, nickname for a one-time notorious red light district bounded by Talbot Street, Amiens Street, Gardiner Street and Seán McDermott Street (formerly Gloucester Street). Mud Island/Friend’s Field/French Field, previous names for Ballybough. Doyle’s Town, previous name for Baldoyle. Ballyboother, previous name for Booterstown. Raytown is a nickname for Ringsend, reflecting its history as a fishing village. 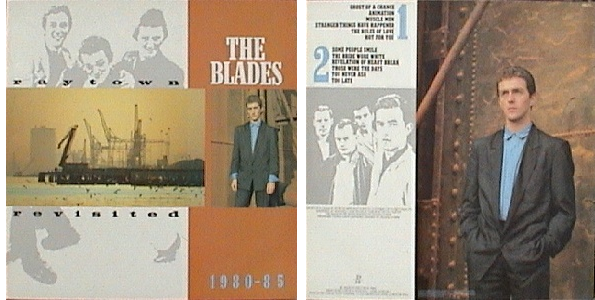 The Blades’ 1985 singles compilation, ‘Raytown Revisted’. The band all grew up in the area. Maryland has a whole lot of streets named after the Blessed Virgin. The estate was built just after the 1932 Eucharistic Congress when the holy flame was still burning brightly. Harmonstown – also known by some as The Scheme. Dollymount and Conquer Hill – two areas, or states of mind, no more than 3 or 4 streets each in Clontarf. The Seagrange estate in Baldoyle used to be called LIttle Jerusalem because all houses in the estate had flat roofs like houses in Palestine.The houses had new apex roofs added in the late 80’s/early 90’s and the nickname fell out otf use. Ah I know one for Tralee in Co Kerry! ‘The Bullring’ it’s called (really called The Crescent’ – Great blog post idea! The Tenters, the area between weavers sq, cork st, south circular, nd clanbrassil st, which also reminds me of blackpitts, check out dublin.ie forums there is an absolute treasure trove of info on the likes of these places and all things dublin, although the forum is now closed for posts it remains a superb resource. keep up good work. c’mon shels! In Killester you have Middle Third, which like some of the other ones refers to a street or an area depending on the context. Also, like Harmonstown (particularly in reference to The Scheme), you would only use the term if it was to narrow down an already understood area. The name was in common use locally up to the time I was living there (1954-75) but was gradually passing out of use as the estate was was expanded with two storey houses and duplexes. I’d think of Summerhill as being from Gardiner Street over to the NCR/Portland Row junction and the streets immediately off it. Maybe down to Killarney Street to the south? I’ve never really ventured too far into the streets on the opposite side…. Or perhaps it goes as far as the canal? Would St. Agatha’s church be considered in Summerhill? Crimmagge? !Where does Crumlin begin and Kimmage begin?! Summerhill – IMO starts at NCR, runs to Gardiner St as the other poster said. On the north side of the main stretch here there are really no roads, just a couple of short cul de sacs. So Summerhill (the street) would really be the northern boundary. To the south, I think Sean McDermott St and its extension, Killarney St, would mark the boundary. Someone from Ballyfermot should tell about The Ranch, The California Hills and the Khyber Pass. And Middle Third in Killester was one of three schemes (with Abbeyfield and the Demesne) built for British Army veterans after WW I. At the very top, beside the convent on Bridget’s Road, what is now their playing fields was a wild area called “the Forty Fields”. Thanks for the aside on Stannaway -anytime I’m on it I’m always struck by how unique it sounds, like it belongs to a different city. The area behind the Royal Oak pub (now demolished) used to be called the Forty HiIls until they built the Violet Hill housing scheme. In the context of this area people might be interested in the “Medlar” Bridge. Not areas, but streets. Glasnevin Hill is known as Washerwoman’s Hill. The road between Ballymun and Santry is called Santry Avenue on a map, but everyone calls it Santry Lane. Holylands was the name of the Corpo house estate next to where The Nutgrove SC is today. It had a carzy bad reputation back in the 1970s and residents included The Dunne Family of heroin infamy. The name of the estate was changed in the early 80s to Mountain View but is still known by many as Holylands. Some there wear the “old label” with pride and u see their banners at SRFC game in Tallaght Stadium. Not far away, at the salubrious sounding Windy Arbour LUAS stop, is Columbanus from The Church of SS Columbanus and Gall near the previous mentioned Nine Arches. The name is shortened in the frequent graffetti as ‘Banus which I saw only last week down in Curracloe, Wexford. The area of cottages just off the Old Finglas Road just before Violet Hill is know as the Puzzle. The large building / complex at the southern end of Harcoourt St, across from the Harcourt Hotel, is known as The Puzzle Palace. LOL. Substantively the entirety of the grounds of Blackrock College. There is a Williamstown Post Office though and formerly, a Williamstown train station. A townland, reclaimed land in the late 19th C. that largely comprises that muddy field that we consider a nature reserve in Booterstown. A townland: Nutley Avenue & Elm Park. Rathmines! Inverted! There was a Norman family from Hampshire in England, de Meones that lent their name to this district, also named “Nova Colonia”. In 1382 a second William de Meones (or de Moens) was Lord of Meonesrath. Known as ‘the Rath’ in the 14th century. Yes. Also known as “Westfarm”: now an industrial estate between the Maynooth train line and the Old Finglas road. “Prospect” was a townland directly east. English influence here. H. South is the grounds of a former lunatic asylum, now private hospital. H. North a partially DCU. See how these places disappear? Another townland with an imported English name, best forgotten. Grace Park Road, Sion Hill. Grace Park Heights, Collins Avenue and Thorndale. Native name for the area? Between the Raheny road and the DART line and Kilbarrack Station. Grange park. Directly east of the Clongriffin DART stop. There was formerly a landed family here, I believe (although there is a Mayne river and the Mayne Bridge). Two townlands directly south of Portmarnock and west of Maynestown. There’s another Snugborough in Cloughran (near Malahide). Ballymun. The actual Ballymun is beyond the M50. Hilarious. Directly south of Carpenterstown and opposite the Hermitage (Lucan). These straddle the Liffey here, very scenic and not built up. Part of the Liffey Valley. A small townland in which Wheatfield Prison (previous site of House of same name) and Coldcut Road. Considered Clondalkin today. Site of industrial estate next to Clondalkin train station. Naas Road directly west of the famous Red Cow roundabout. A townland after which the famous hotel. Directly west of “Bushelloaf”, the Naas road and the Newlands crossroad. Newlands Desmene is further west. Weird name. Part of the playing fields and grounds in which the Newlands Cemetery is located. An alternate name for Kingswood Heights, Tallaght. Firhouse. There is a Tymon South Post Office in fairness. A large Park located between the Braemor Road and the LUAS line. The Goatstown Road-Roebuck Road intersection. Another townland of the 19th c. supposedly named after a famous tree(s) in which the destitute beggars lived under, being expelled from Dublin daily. Grand canal dock, Charlotte Quay. Townland today the site of Croke Park and adjacent villas, Sackville avenue. Yes. Read about it: somewhere in north county Dublin, referred to in medieval documents. Location today a mystery. Matt Ryan’s a play on the name Rathmines. The Black Banks – just to the south of the above. There’s no ‘the’ – it’s just known as Blackbanks, as far as I know it’s just one word, and it seems to have very much slipped out of usage, unfortunately. And Byrne’s which is in Galloping Green (technically Stillorgan, Foxrock for poshies) is called Phillipstown House! Interesting – I grew up near Harmonstown and always thought of it as an official area name, as much as Raheny, etc. neighbouring it. Not so much like an area within an area as some of the other places you’ve listed. What about Cowper in Ranelagh? Dartry nearby as well. Bayside out in Kilbarrack/Sutton. Always liked the sound of Knockmitten Lane meself but turns out to be a dismal enough locus in an industrial estate…. Moreenaruggan and Bushelloaf are not in common usage.